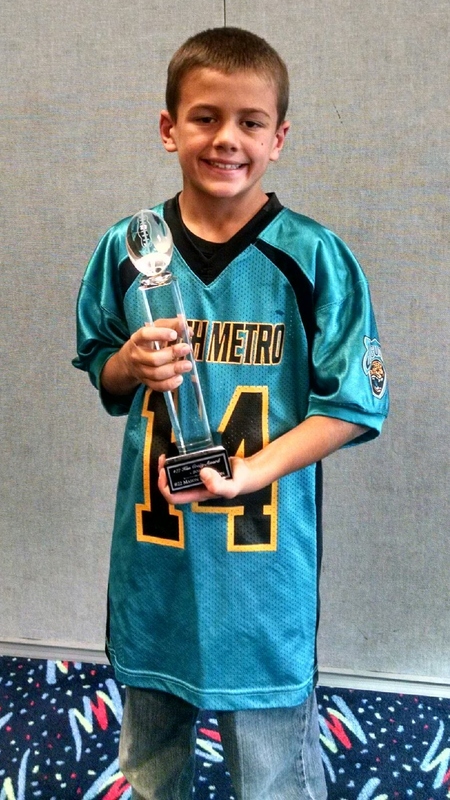 The Ken Craig award is given annually to the North Metro Junior Football player who most exhibits those characteristics that Ken embodied- Fair play, good sportsmanship, leadership on and off the field, a never quit attitude and someone that works extremely hard in every facet of their lives. Ken would have loved to be honored in this way by NMJF, and Ken would have been especially proud to honor this this year’s Ken Craig award recipient – Mason Danielson. *Mason is a leader both on and off the field. His teacher at school praises Mason for being a leader in the classroom. *Mason is also a leader at home helping his siblings learn to share. *Mason has earned the Jackie Robinson award at school and his assistant principal praises Mason for his hard work and scholastic achievement. *Mason is a leader on the field and helps his teammates excel. Mason’s coach said that he is one of those players that gives you everything he has. 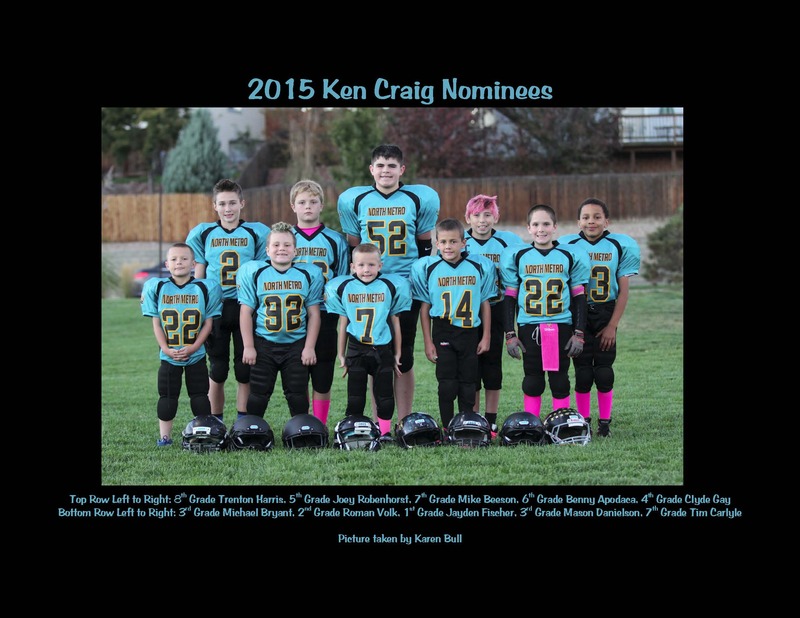 He was voted team captain by his teammates and led with a positive can-do attitude. 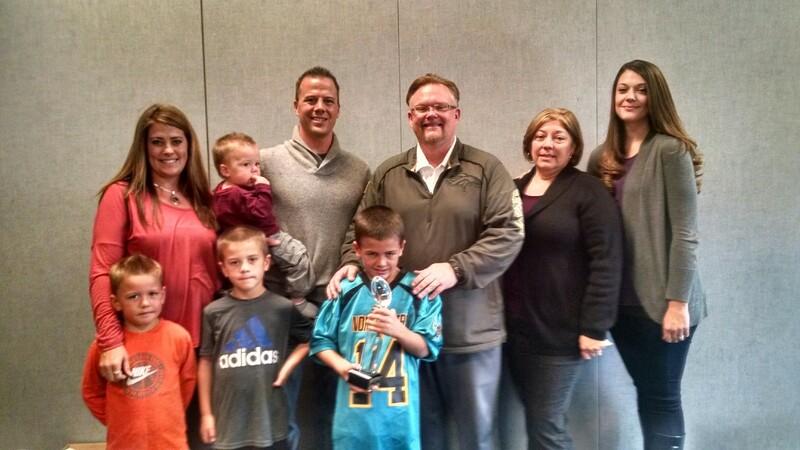 *Mason also participated in the “tackles for Karen” charity project. Mason helped raise over $135 dollars for the Shiloh House which helps homeless children. **The thing that most struck me when reading all the applications for this award is that Mason helps others….thinks of others before himself. Mason is a very dedicated and thoughtful leader on and off the field and Ken would be proud to call him a friend. Mason, you are a selfless leader, and I want to thank you for all your hard work in school and on your sports teams. You display many of the same qualities as Ken did, as you are always seeking to improve and help others. Congratulations on winning the award, you are certainly very deserving.